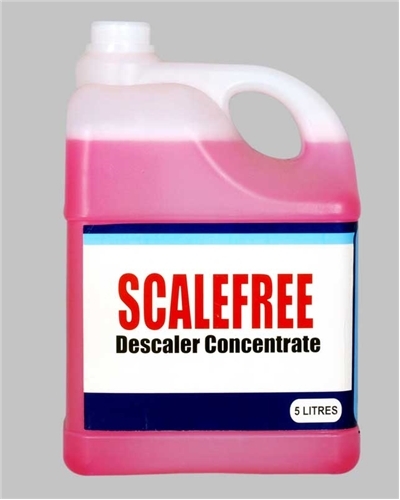 SCALEFREE is a highly acidic descaler concentrate containing organic acids for the easy removal of lime scale from kitchen equipment, bathroom taps, utensils, etc. 1) SCALEFREE is an acidic cleaner for the easy removal of lime scale from kitchen equipment’s, plastic articles, granite, boilers, steamers, chaffing dishes, tea and coffee pots. Very effective in removing lime scale. Dissolves Calcium and magnesium salts. Cleans and brightens metal surfaces. Use the concentration of 50- 400 ml. (5 to 40% ) in 1 liter of water depending upon the intensity of scale. Scrub the scale with a scrub pad and rinse thoroughly with clean water. For spray application - Use neat solution of 300-500 ml / liter of water and apply on equipment. Leave for at least 10 minutes and scrub. Rinse thoroughly with clean water. pH: neat 1.5. Use gloves for sensitive skin. In case of contact with eyes rinse immediately with plenty of water and seek medical advice. © Alpha Products. All Rights Reserved.